.22 Winchester Rimfire or 22 WRF ammo (not to be confused with the .22 WMR or .22 LR) is a cartridge used in a number of older rimfire rifles. It is primarily used for small game hunting. Cartridges for .22 WRF typically produce velocities of about 1,400 feet per second with a 40 or 45 grain bullet. CCI still produces ammunition in this caliber which is suitable for taking rabbits, squirrels, and other varmints. 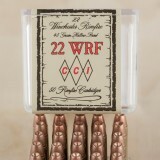 When in-stock, you'll see our whole line-up of bulk 22 WRF ammo for sale on this page. These .22 WRF cartridges from CCI are loaded with 45-grain bullets that use a jacketed hollow point design. This makes them extremely effective at the target by delivering outstanding terminal ballistics. The cartridges will come out of the muzzle with a velocity of 1,300 feet per second and an energy of 169 foot pounds. 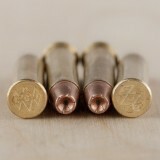 Thanks to a pure copper jacket, the rounds are extremely reliable in older barrels. Order this box and you’ll have 50 rounds for your .22 WRF rifle. 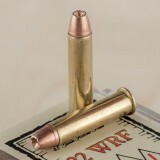 The .22 WRF is a popular rimfire cartridge that has a popular following among target shooters and small game hunters. It have been used for rabbits, prairie dogs, and even squirrel. By delivering top-notch accuracy with very little recoil, this is a favorite cartridge for general plinking and target shooting. CCI specializes in high-quality rimfire cartridges. They also create world-class ammunition and reloading supplies for handguns and rifles of many different calibers.